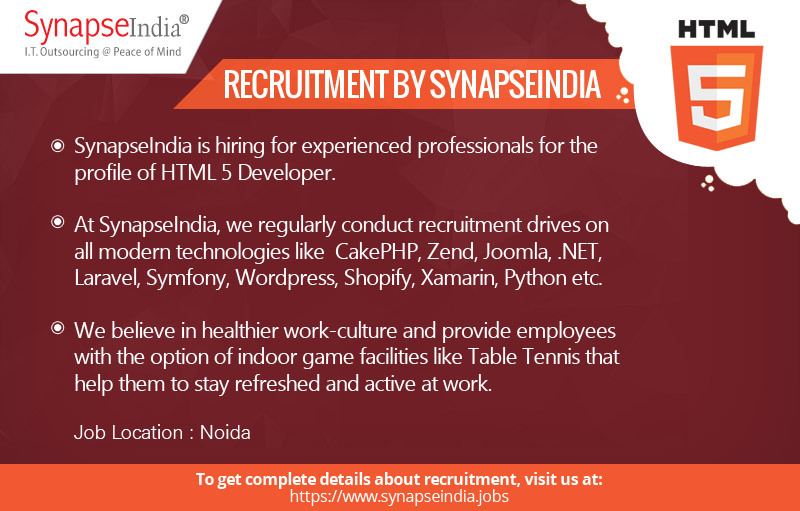 The SynapseIndia Recruitment team is looking for experienced HTML 5 Developers. The job location is Noida. At SynapseIndia, we regularly conduct recruitment drives on all modern technologies like CakePHP, Zend, Joomla, .NET, Laravel, Symfony, Wordpress, Shopify, Xamarin, Python etc. We believe in healthier work-culture and provide employees with the option of indoor game facilities like Table Tennis that help them to stay refreshed and active at work.